Gordon Brown has apologised in the House of Commons for the failings of a hospital described as "appalling" by an NHS watchdog. 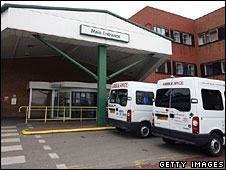 Poor standards in emergency care at Stafford Hospital meant patients needlessly died, a report by the Healthcare Commission found. The prime minister said he wanted to apologise to those who had suffered. The government has already said a series of inquiries would be held to find out what went wrong. Mr Brown said: "We do apologise to those people who have suffered as a result of the mistakes that have been made at Stafford Hospital." But he reject suggestions NHS targets had contributed to the problems identified. "There were low standards of management." 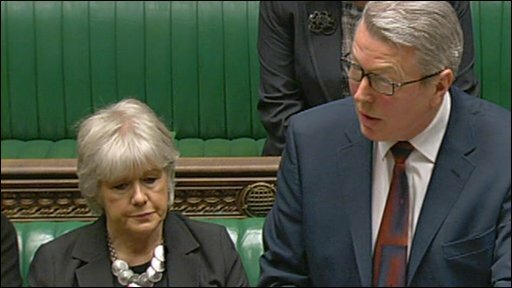 Health Secretary Alan Johnson also apologised for the "pain and anguish" caused. He confirmed government officials would be investigating current standards of emergency care and why local and regional health bosses failed to spot the problems at the time. Mr Johnson said: "Patients will want to be absolutely certain that the quality of care at Stafford hospital has been radically transformed, and in particular, that the urgent and emergency care is administered safely." On Tuesday, the Healthcare Commission report revealed that between 2005 and 2008 there were 400 excess deaths at the hospital - although it was impossible to say whether these had all been caused by bad care. The report said there were deficiencies at "virtually every stage" of emergency care and managers pursued targets to the detriment of patient care. It cited low staffing levels, inadequate nursing, lack of equipment, lack of leadership, poor training and ineffective systems for identifying when things went wrong. The watchdog said the situation was so bad that receptionists had been used to carry out initial assessments on patients in A&E. Mr Johnson said relatives would be able to request that case notes be reviewed to see if the care their loved ones received had been appropriate. He added: "The failings at Stafford hospital are inexcusable. "I hope we can close this chapter in the hospital's history, by acknowledging and addressing past failings, and by ensuring that lessons are learned." Shadow health secretary Andrew Lansley said the strategic health authority, which oversees NHS standards regionally, had had the "wool pulled over its eyes". He also raised concerns about the Care Quality Commission, which is taking over from the Healthcare Commission in two weeks time. The chief executive of the CQC is Cynthia Bower who was head of the SHA responsible for Stafford Hospital in 2006 until her appointment recently. Mr Lansley asked the health secretary: "Are you confident that CQC will intervene where necessary in future and be effective when it does so?" And Liberal Democrat health spokesman Norman Lamb urged the government to scrap the four-hour A&E waiting time target. "The catalogue of failings identified by the report are a horrifying indictment of the way that targets are placing financial goals ahead of patient care." What are the lessons for the NHS?